Nampak's board of directors believes that good corporate governance contributes to fairness, competence, enhanced accountability, ethics and transparency. The board sets the direction of the organisation and is ultimately accountable and responsible for the performance and affairs of the company, and is satisfied that it fulfilled all its duties and obligations in the 2018 financial year. Nampak complied with the Listings Requirements of the JSE Limited and applied all the principles of King IV™. A statement on Nampak's application of the principles of King IV™ is available on www.nampak.com. Nampak is committed to conducting its business ethically and in compliance with all applicable laws and regulations, while focusing on effective risk management to ensure long-term sustainable development. Necessary processes are in place to ensure that all entities in the group adhere to essential group requirements and appropriate minimum corporate governance standards. A code of conduct and business ethics sets the minimum standards expected of all directors and employees. Violations may be reported through "Tip-Offs Anonymous", which is independently administered by Deloitte & Touche and is accessible 24 hours a day, seven days a week. The primary purpose of Nampak's compliance programme is to ensure that Nampak conducts its business strictly within the confines of the law. Its aim is to promote and ensure compliance with laws, regulations and company policy, while also enabling the company to address transgressions immediately. The programme is currently being refined. Safety, health, environmental and competition laws remain Nampak's key legal compliance areas and receive the necessary attention on an ongoing basis. During the year Nampak also focused on the Protection of Personal Information Act, No 4 of 2013, the provisions of which will be implemented during the year ahead. During the year under review, there have been no material violations of any laws or regulations, nor were any material penalties or fines imposed on the company or its directors for contraventions of any laws or regulations. 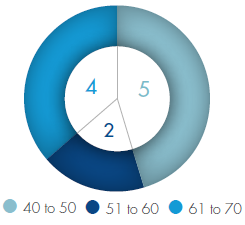 All non-executive directors are considered to be independent. The board comprises an appropriate combination of executive and non-executive directors with a balance of skills, experience and independence, to conduct the business of the company in a professional and effective manner. 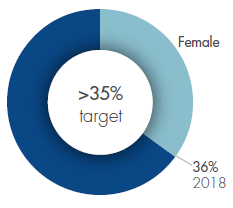 Board diversity enriches the collective perspective and contributes towards a sustainable and competitive advantage and the board's gender and race diversity policies are specifically taken into consideration when reviewing the composition of the board and its committees. The board has reconfirmed the independence of its non-executive directors who have been in office for more than nine years, namely RJ Khoza, RC Andersen, PM Madi and PM Surgey whose experience, knowledge and independent judgement continue to benefit the company. Mr RC Andersen, Prof PM Madi and Ms NV Lila are the directors who are required to retire as directors of the company in terms of clause 29.1 of the MOI. Mr Andersen and Prof Madi have decided not to avail themselves for re-election due to their tenure on the board. 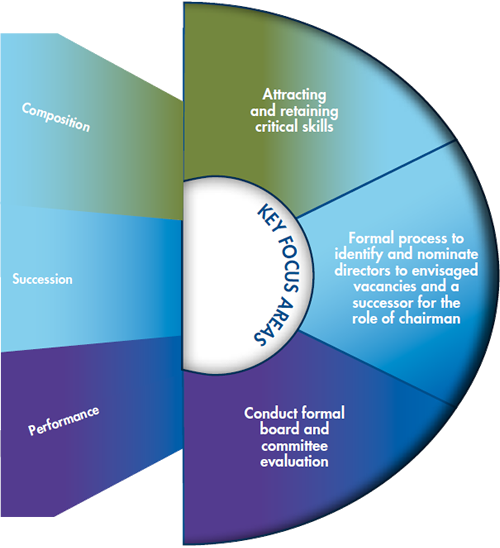 Taking into consideration the tenure of service of some directors, succession planning is currently a key focus area, with a view of also augmenting certain skills on the board. 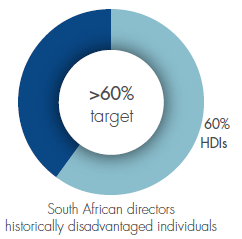 For a summary of the biographical details of directors, refer to Board of directors in the integrated report. For full details, refer to our website, www.nampak.com. 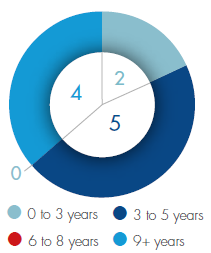 * Diversity of the board as at date of publication. The CEO attends meetings of the audit committee, the nomination committee or the remuneration committee by invitation. He is requested to leave the meeting, where appropriate, before decisions are made which relate to him personally. 1	Resigned with effect from 10 October 2018 following his appointment as Minister of Finance in South Africa. 2	Lead independent director (LID): appointed as chairman of the board with effect from 10 October 2018. 3	Refer to table for board attendance. 4	Member: appointed as chairman on 2 February 2018. 5	Remained a member but retired as chairman on 1 February 2018. 6	Meetings held on 1 November 2017 (special), 15 November 2017, 4 April 2018 and 15 May 2018 (NV Lila unable to attend due to illness). 7	Member: appointed as chairman of the committee with effect from 10 October 2018. 8	Meetings held on 14 March 2018 and 18 September 2018 – all members attended. 9	Resigned as chairman of the committee with effect from 10 October 2018 due to his appointment as chairman of the board. 10	Member: appointed as chairman with effect from 10 October 2018. 11	Meetings held on 15 November 2017, 14 March 2018 and 18 September 2018 – all members attended. 12	Resigned as ex officio member due to his retirement as chairman of the audit committee on 1 February 2018. 13	Appointed as ex officio member by virtue of her appointment as chairman of the audit committee on 2 February 2018. 14	Meetings held on 16 November 2017 (AM de Ruyter unable to attend due to an official visit to Angola) and 25 July 2018 (PM Madi unable to attend due to a prior commitment). 15	Meetings held on 17 November 2017 (AM de Ruyter unable to attend due to an official visit to Angola) and 10 May 2018. 16	Ad hoc committee. Meeting held on 8 May 2018 – all members attended. 17	Appointed as member with effect from 8 November 2018. 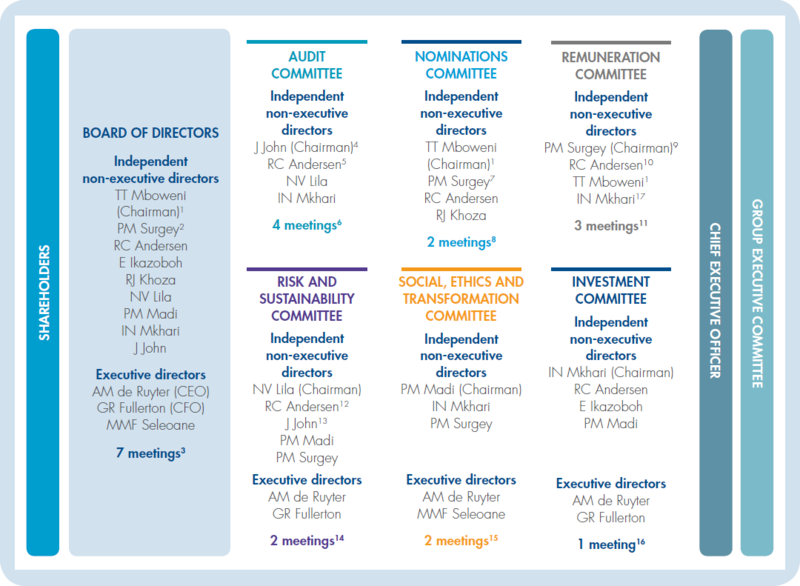 The roles and functions of the chairman, the lead independent director and the CEO are described in the board charter available on our website at www.nampak.com. * Board meeting and strategy conference. 3 Unable to attend due to bereavement. 1 Special meeting. 4 Unable to attend due to illness. 2 Unable to attend due to prior commitment. The board and all the board committees actively support the company's long-term strategy, ensuring sustainable profitability and unlocking further value through increased operational efficiency and cost management. 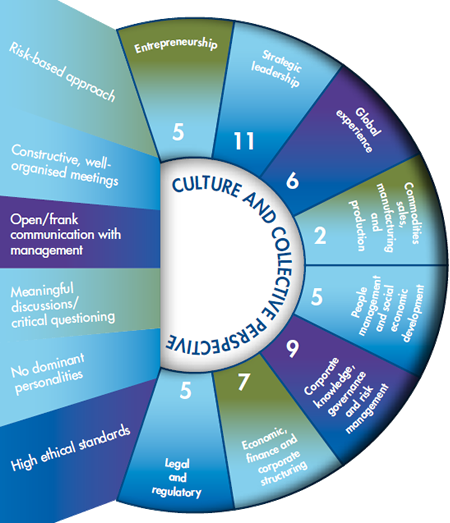 The committees play an important role in enhancing corporate governance and effectiveness within the group. The committees support the board by providing oversight and direction in their areas of responsibility, and report to the board through their respective chairmen. The committee charters outlining the responsibilities of each committee are reviewed annually by the board and are available on our website, www.nampak.com. The committee is a statutory committee constituted in terms of the Companies Act. 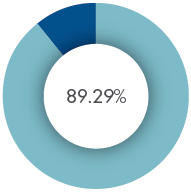 It primarily assists the board to oversee the quality and integrity of Nampak's integrated and financial reporting; the qualification, independence and effectiveness of the internal and external audit functions, and internal controls. Chairman Jenitha John: "The committee continues to play a key role in overseeing the quality and integrity of the company's results, integrated report, the effectiveness of the internal and external audit functions and the adequacy and effectiveness of internal financial controls, risk management and governance." Refer to the annual financial statements for the audit committee report. The committee is responsible for ensuring that the group remunerates its directors and employees fairly, responsibly and transparently. Chairman Roy Andersen*: "The committee focuses on ensuring that our remuneration is fair and equitable and that it encourages management and staff to act in the interest of all stakeholders." Refer to the remuneration committee report for details of directors' remuneration and other relevant remuneration information. * Chairman with effect from 10 October 2018. The committee is mainly responsible for assisting the board and makes recommendations regarding the composition of the board and its committees, succession planning and the appointment of directors as well as managing the performance of the board, the board committees and directors. Chairman Peter Surgey*: "The unforeseen appointment of Tito Mboweni as the Minister of Finance resulted in a significant loss to the board. Although the committee had already started focusing on succession planning, this process will be accelerated." The committee performs the role of a social and ethics committee as required in terms of the Companies Act, and assists the board to ensure that the appropriate strategies, policies and processes are in place in order to drive transformation and the continued development and sustainability of an ethical culture within the group. Chairman Phinda Madi: "Nampak redoubled its B-BBEE efforts, centralising control and visibility of all activities through the new B-BBEE steering committee. 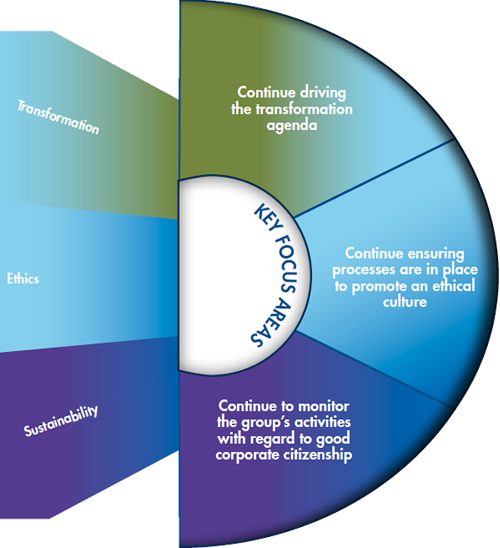 Ethics remained a major focus area, requiring ongoing vigilance. This is particularly true considering that many South African companies have become more exposed to ethical challenges at home given the phenomenon of state capture. In a spill over from the political arena, the tip-offs line recorded more calls alleging interracial tension. Whether real or imagined, each reported incident was dealt with seriously, swiftly and decisively." The committee is responsible for ensuring effective risk management oversight and providing direction on the overall sustainability processes. Chairman Nopasika Lila: "Our committee works to better understand the risks to the sustainability of the organisation. Risks are inherent in strategy, but we need to know how to set effective controls to allow us to achieve the strategy. 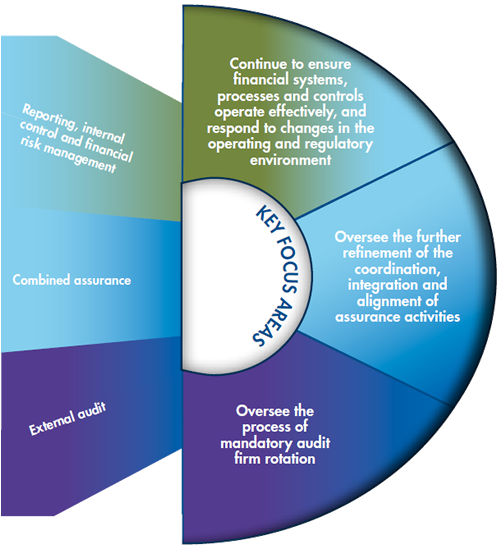 While managing and monitoring risks we are conscious of the importance of integrated reporting, as through that process gaps will ordinarily be revealed." The committee is responsible for providing strategic direction and ensuring prioritisation and optimisation on groupwide, high-risk and value investment and funding decisions. Chairman Ipeleng Mkhari: "We focused on key capex requirements, and approved further investment by Bevcan in Angola subject to the transfer of cash that had been trapped there in the face of severe liquidity restrictions. We are positive about deploying more capital in Angola, as demand has not tapered and the outlook for the business is good. We implemented stronger committee policies and processes, the most important of which was the post-investment strategy to ensure capex and acquisitions deliver the expected returns. The transferring of cash from Nigeria and Angola is a positive indicator for future investments in these countries." The development of industry knowledge is a continuous process and the board is continually appraised of new developments and changes in Nampak's business environment. Training is also provided to individual directors on request. The company has a formal induction programme, which includes the opportunity for new directors to visit key operations. Directors are entitled to obtain independent professional advice, at Nampak's expense, and enjoy unfettered access to group records and company employees, in order to discharge their duties. 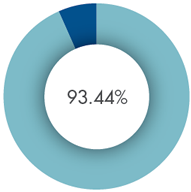 The evaluation of the performance and effectiveness of the board, its committees, individual directors and the chairman was externally assessed in 2017. The next formal assessment will be conducted in 2019. The board reflected on its performance during 2018 and re-confirmed that, in its view it continues to function effectively and professionally and that decision-making processes are robust. Priority focus recommendations for the year ahead include the attraction and retention of certain critical skills. The effective functioning of the board is facilitated and supported by the company secretariat. Nampak's company secretary is IH van Lochem, who was appointed with effect from 1 September 2017, in accordance with the Companies Act. Ms van Lochem is a member of the group executive committee and reports to the CEO. The company secretary is not a director. Having considered the competence, qualifications and experience of the company secretary, the board is satisfied that she is competent and has the appropriate qualifications and experience to serve as the company secretary. The board considered the interactions between the company secretary and the board, and is satisfied that there is an arm's length relationship between the board and the company secretary. For more details on the responsibilities, powers, policies, and processes of the board, directors, the group executives, the company secretary and other officials, refer to the board charter as well as the memorandum of incorporation of the company on our website, www.nampak.com.